The floating decanter utilizes a circular weir for decanting supernatant liquid and a flotation device for buoyantly supporting the weir within the basin. The floatation device also acts as a baffle to prevent scum from being withdrawn during the decant step. For the successful operation of an SBR, the decanter must be designed to prohibit Mixed Liquor Suspended Solids (MLSS) from entering the decanter during non-decant sequences as well. Fixed decanters which were Air filled except during the Decant phase. Decanter design with spring loaded solids excluding valve that is opened by hydraulic differential during decant phase. Decanters which are removed from the reactor & reintroduced during the Decant phase. Though many types of decanters are used most commonly used is Floating Decanter or adjustable weirs. The decanter withdraws around 15 -20” below the water surface & rate of decantation is controlled by Automatic valves or by pumping. Typically 25% of volume of SBR is decanted during decant phase. This leaves nearly all of the Activated sludge within reactor. Around 40 – 50 minutes of Decant phase is required normally. The decant phase should not interfere with settled solids and also should not cause vortex resulting into floating of solids. 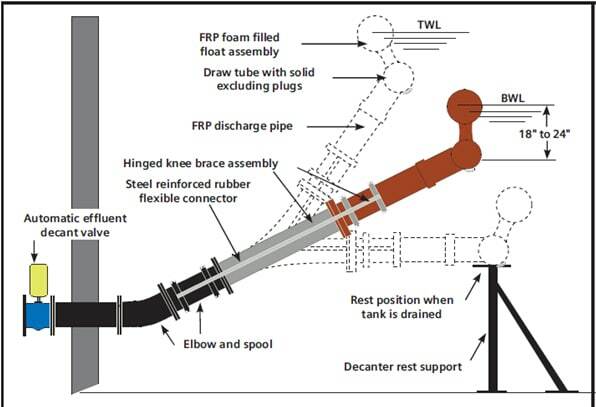 In order for reduced or limited withdrawal of solids from the SBR during the Decant phase, the following operational as well as design guidelines need to be followed. The decanter should draw the treated supernatant from below the water surface & exclude foam & scum. An adequate zone of separation between the sludge blanket & decanter should be maintained at all times during Decant Phase. A means for excluding solids from entering decanter during React as well as Settle phase should be provided.